This month we've released new mobile screencasting app and introduced Quick Sync Video in our Transcoder as well as some other features. But first check out a new article from our P2P partner Peer5 - HLS with Nimble - which describes the process of Nimble Streamer setup for both VOD streaming and RTMP transmuxing to HLS. The result stream can be used as a source for Peer5 serverless CDN which highly reduces traffic coming from from the origin. Check our P2P streaming overview page showing different P2P capabilities and use cases. Our latest product Nimble Streamer Live Transcoder now supports Intel® Quick Sync Video technology for hardware acceleration. You can check our Quick Sync featured page for all details including Quick Sync encoder setup parameters and the process of enabling Quick Sync HW acceleration on Windows and on Linux. This new integration allows using full power of Intel processors for your streaming scenarios. We're asked how is our transcoder different from FFmpeg library which is a worldwide well-known product. We've released an article describing the benefits of our product over FFmpeg. Our mobile SDK can be used for a number of live streaming cases. One of them is screencasting when you transmit the content of your screen to any destination. We introduce Larix Screencaster which is based on mobile SDK and is capable of streaming via RTMP or RTSP. You can get it on Google Play and set it up as described in this article. You can get our mobile SDK here. In case you used it before, notice that it has a number of new features and improvements including the aforementioned screencasting. Nimble Streamer now has the enhanced interleaving compensation. It helps a lot in cases when video or audio stream has some delay. Another enhancement is LATM header support for AAC while streaming via RTSP and MPEG-TS. One more interesting feature is live HEVC transmuxing into HLS. This is useful for the cases when your end users devices are capable of H.265 playback. The last but not the least update: check the State of Streaming Protocols for June 2016. Follow us at Facebook, Twitter, Google+ or LinkedIn to get latest news and updates of our products and services. The metrics calculations are based on nearly 3 billion views. The stats are collected from 2800+ media servers (Nimble Streamer and Wowza). Protocols share remain stable, i.e. HLS share is about 70% with progressive download having 9%. You can compare that to May stats below. Nimble Streamer has wide variety of audio-related features and advantages. This includes processing of AAC in any available incoming stream regardless of its protocol. Speaking of AAC, most audio encoders produce AAC with ADTS headers which is commonly used over the Internet. Now Nimble Streamer supports LATM header in addition to ADTS. It is widely used in satellite streaming over DVB, DVB-T and DVB-T2. This header can be processed from incoming RTSP and MPEG-TS streams for further transmuxing into other protocols for live streaming. The stream can be also be handled in our Live Transcoder for further transformation. If you need any help on this feature set, feel free to contact us. Nimble Streamer Transcoder supports Intel® Quick Sync technology for both software video encoding and hardware encoding acceleration using Intel® processors feature set. Nimble Streamer now allows using Quick Sync as a H.264 video encoder in transcoding scenarios. Once you have Quick Sync installed, the software encoding is available in our Transcoder by default while hardware acceleration needs to be enabled separately. Let's see how hardware acceleration is enabled on Windows platform for Nimble Streamer. We assume you've already installed Nimble Streamer and the Transcoder on top. To make Quick Sync work, you need to install Intel® Media SDK first. Follow this link to fill in the form and get the SDK installation package. In Windows operating system starting from Windows Vista and later, implementation of hardware acceleration relies on interaction with the hardware graphics drivers. The system isolates the services in a non-interactive environment called "Session 0 Isolation." Applications running in this isolation don't have access to hardware drivers. This means when Nimble Streamer is launched as a system service, Quick Sync hardware acceleration isn't available. Intel® Quick Sync technology provides efficient encoding capabilities. It allows using hardware acceleration for video encoding using Intel® processors feature set and software encoding in all other cases. Nimble Streamer Transcoder allows using Intel® Quick Sync as a H.264 video encoder in transcoding scenarios. Let's take a look at encoder settings available at the moment. First of all, take a look at Quick Sync encoder usage in our web UI. As you see, it takes just a few clicks to use Quick Sync as encoder. Now let's see what parameters you can use there in order to control encoding process. It's similar to previously described libx264 encoder settings but it has its specifics. In the encoder settings dialog box you can add any of the parameters described below. Each live stream includes 2 parts - video and audio. They usually go hand-by-hand but sometimes they are un-synchronized, which means video or audio stream has delay comparing to its counterpart. This behavior was seen in some of MPEG-TS hardware encoders like Elemental and Digital Rapids as example. Small delays are usually compensated by all player software but as far as the delay becomes significant - up to a few seconds - this becomes a problem which leads to playback failure in some players like VLC. This issue is overcome by adding interleaving compensation. What it does is that it creates a buffer of incoming frames and sorts them for further output. This solves the described problem but introduces some delivery delay and resource overhead because buffering and sorting is done for all stream all the time. This operation is resource-consuming and brings latency into streaming process, as each frame is placed into the buffer and needs to be held at least until the next frame comes in. This is why Nimble Streamer has this compensation disabled by default and you need to specifically enable it to make this work. As always, this is done via WMSPanel web control UI. You can enable it both for the entire server and for any specific application. Live Transcoder for Nimble Streamer is a highly efficient product which uses best available transcoding techniques combined with our own know-hows and researches. One of the components used in Transcoder is FFmpeg™ project. We use some of its libraries under LGPL, you can see details on our legal details page. Many other projects use FFmpeg as a standalone turn-key solution being handled as an external tool. That brings a great result, however we decided to take its best parts and use it linked into our middleware. This brings some development efforts, however it gives us several unique benefits which make our Live Transcoder more efficient and robust than FFmpeg used as command line tool in some cases. Let's see what makes Live Transcoder for Nimble Streamer differ from out-of-the-box FFmpeg and sometimes more efficient. Our team is continuously improving mobile streaming products set. Using mobile device, you may want to show your screen content to the public in real-time. This might be your game play process displayed at popular streaming services like Twitch or YouTube. It can be your mobile device product live presentation on a conference or a webinar. These scenarios require capabilities to capture your screen and stream it outside the device via some real-time protocol. Larix Screencaster is a free app for Android. It's capable of streaming screen content in real time to any destination which supports RTSP and RTMP publishing of H.264/AAC stream over TCP. The Screencaster runs in background and can be controlled from notification area. Besides streaming the content Larix Screencaster allows recording it to MP4. The application was successfully tested with Nimble Streamer and Wowza Streaming Engine as well as YouTube live streaming. You may use any media server, including Nimble Streamer. You may take a look at Larix Broadcaster setup instruction to see how you can install and setup Nimble for this task. If you'd like to create similar Android app capable of media streaming, you can use our mobile broadcasting SDK which is the core of Larix Screenaster. You will get Larix source code and a library for further UI customization. This month we're glad to introduce important updates for our products. Our team is proud to introduce a long-awaited product - Live Transcoder for Nimble Streamer. It's a premium add-on for our freeware product and it has an affordable price. It takes H.264, MPEG2 video with AAC, MP3, MP2, Speex audio via RTMP, RTSP and MPEG-TS to transform it into H.264/AAC to deliver via HLS, MPEG-TS, RTMP, RTSP and MPEG-TS protocols. Each stream is decoded just once for further processing. Multiple transcoding threads are used on multiple CPU cores for high performance. At the other end, encoding is also done once after all transformations. This month we'll introduce QuickSync support for hardware encoding as well. Multiple FFmpeg filters maybe used for content transformation for both video and audio. Excellent WMSPanel web UI allows controlling multiple transcoders via single interface, with no interruption to the streams when applying changes. Visit our website for more details and feel free to go ahead and install Transcoder to see it in action. As we've already noticed last month, you can take a look at our YouTube Channel to see how you can use the Transcoder. Visit our API reference page to see how they can be used. Our mobile broadcasting SDK has also a major update. It now allows MP4 recording and screenshots capture during recording. You can see them in action at Larix Broadcaster. You can install it via Google Play and AppStore. Contact us if you'd like to purchase the SDK for your own applications development. Those customers who use RTSP publication, already saw our RTSP publish control framework which allowed managing incoming publishing connections according to their own business logic. Now we added RTMP support to that framework. Read RTSP and RTMP publish control framework overview article to find out the details. 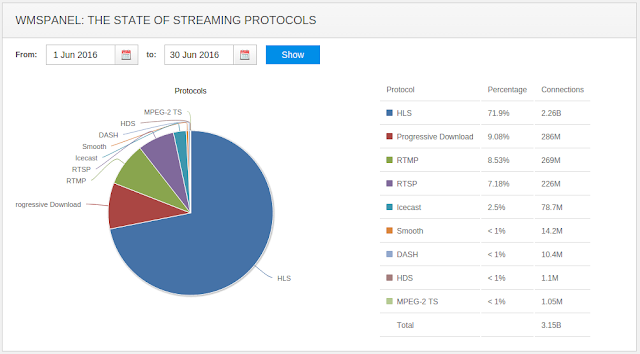 The last but not the least update: check the State of Streaming Protocols for May 2016. Follow us at Facebook, Twitter, Google+ or LinkedIn to get news and updates of our products and services.